This morning (or yesterday evening, for the organised), clocks across Britain were set forward one hour. This is something that has always irritated me. Why do we need to do this? If we want to make the most of light mornings, why can't we just get up earlier? Why do we need to fool ourselves into thinking that the time is an hour later than it really is? Here's the thing that irritates me: British Summer Time is not real . The position of the hands on a clock face are a measurement, and as such, should aim to measure as accurately as possible. But what are they measuring, exactly? Well... it gets a little more complicated than you might expect when you try to answer this question. Roughly, it's the position of the sun in the sky, but not relying on actually being able to see the sun, and extended through the hours of darkness, too. It's a measure of the Earth's rotation. As such, Noon should mean the time when the sun reaches its highest elevation in the sky. There are two things which make this an approximation. 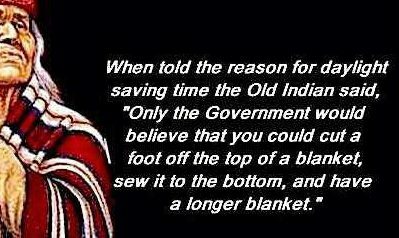 The first is the use of time zones. 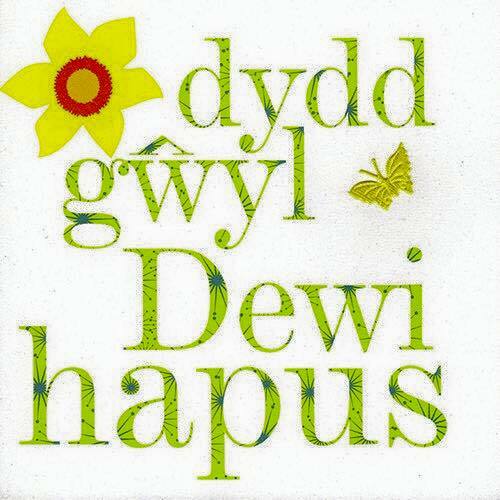 Here on the west coast of Wales, the sun sets fifteen minutes later than it does in London and similarly, noon - meaning the highest elevation of the sun - is fifteen minutes later as well. It used to be the case that every town operated to its own local time, but the coming of the railways made it necessary to keep the same time across the whole country. Imagine trying to devise a train timetable with a different time zone for each stop! I can see the sense in having the same time across the country, so the time is accurate to within about half an hour. For that purpose we all use Greenwich time (the political choice of a location right at the east of the country is also a little irritating - somewhere in the middle would be better), but what about the mean part of GMT? This is mean in the sense of average and derives from the fact that noon-to-noon is not exactly 24 hours, most of the time. On some days it takes a little more and on other days a little less than 24 hours for the sun to return to its highest elevation in the sky. The reason for this variation is the eliptical shape of the Earth's orbit around the Sun. I was going to give you a brief explanation there, but then I looked it up and it got complicated. If you're interested, Wikepedia has a lengthy article on the subject. The upshot is that some of the time, a sundial is fast relative to a clock, and some of the time it is slow. When clocks were new, the sundial was taken to be correct and an adjustment was applied to the new-fangled clocks to calculate the correct, sundial time. Nowadays, if you are so inclined, you can apply the adjustment (in reverse) to sundial-time to get the correct time as per a clock. This leaves me in a quandry. I share the modern instinct that the regular clock, with exactly 24 hours each day, is the more correct measure of passing time, but if the sundial, which reliably reports the position of the sun, is inaccurate, what are we measuring with the clock? The concept time of day has become abstracted away from the position of the sun, and that abstraction opens the door to people mucking around with it, with time zones and daylight saving. This feels wrong, as if we've somehow become separated from a fundamental aspect of the natural world. I am very tempted to set up a sundial in my garden and use only that for timekeeping. If only we had more sunlight. After starting off my home brew in the kitchen, I move it downstairs to the store room, which is rather cooler. The lower temperature seems to have been a problem for the wine yeast I used last year, and I have a dozen demijohns full of half-fermented wine. I'm hoping it will get going again when the weather warms up, but I'd prefer yeast that doesn't need much warmth to ferment. I'd been thinking of buying lager yeast, as that works at lower temperatures than most, but then I had another idea: The wild yeast that I'm using as a sourdough starter seems quite happy in cool temperatures (i.e. winter kitchen temperatures) and I've heard of people getting yeast from sourdough for cider; maybe I could do the same for beer. I added extra water and left the starter until it separated out, then drained off the cloudy liquid, leaving as much of the floury gloop behind as possible. I don't really want starch in my beer. I added this to my usual heather ale recipe and left it to see what would happen. The quantity of yeast cells in that bit of liquid was probably pretty small, so I gave it longer than I usually would to check for signs of life. That is, I checked for bubbles frequently, but gave it three days before giving up. Last autumn, I chucked a couple of crab apples in a jar of sugary water in the hope of cultivating wild yeast from the apple skins. The jar was still sitting on the kitchen counter, smelling... possibly alcoholic, possibly just appley - certainly not foul. I poured that in. A day later, I added some more of the sourdough starter, this time being less fussy about the starch. Eventually, I saw tiny which flecks on the surface - little bubbles? I monitored further until it became obvious that the white fleck were not bubbles, but some kind of growth. Oh, *&#%! That is not the kind of life I was hoping to see. However, before throwing it all out, I did a bit of research, and learned a new word: Pellicle. 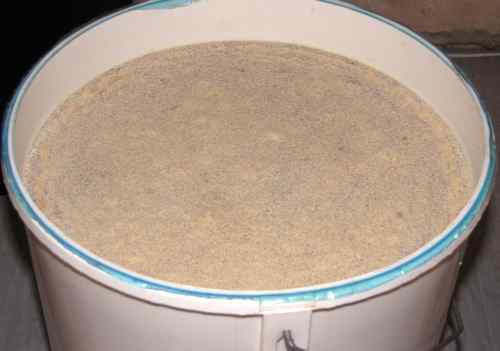 This is a layer that forms on top of wort during the brewing of beer. 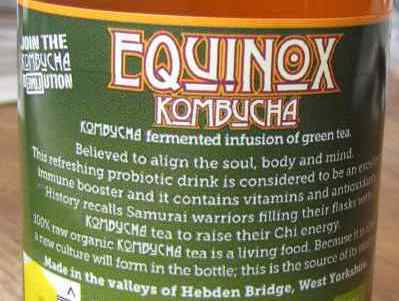 It's the same kind of thing as the scoby that forms in kombucha brewing, but not the same micro-organisms. 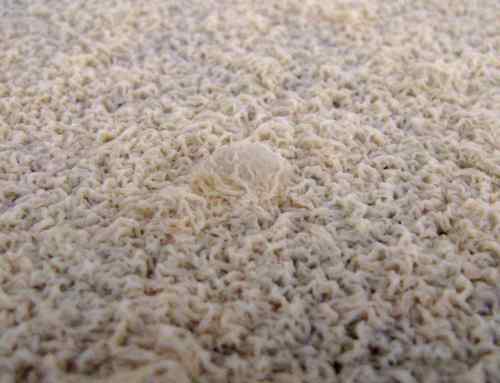 While the cultivated brewing yeast doesn't form a pellicle, other strains of the same species can do, so it's entirely possible that wild yeast might do so. My pellicle smelled a little musty, but not too strong or foul. I also poked a dropper through the surface to take a sample of the wort, and that tasted fine, so I left it to see what would happen. A day later, I saw bubbles under the surface. Bubbles indicate fermentation, so there's definitely something going on, though of course, I don't know what kind of fermentation. It still smells OK, so I'm going to wait and see what develops. At worst, I'll get something that smells and tastes horrible, and I'll have to throw the whole lot away. Alternatively, it might taste of nothing, which is also not worth keeping. Another possibility is that mainly acids are forming, in which case I might have two gallons of vinegar, which is not ideal, but worth something. There's also a chance that I might end up with a delicious and unique beer. I'll just have to wait and see. I enjoy a drink of beer or wine, but often as not, it's for the taste rather than the alcohol content. I don't really like sweet drinks with food and, apart from plain water, there aren't many savoury alternatives. My interest in fermented foods led to me hearing about fermented drinks, including kombucha, and wondering whether they might be a good alternative. The first step, then, was to try some and see what it tasted like. but it looks much the same, I think. 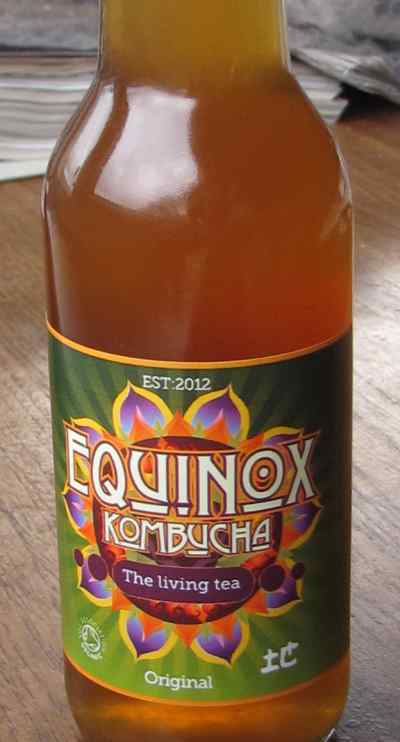 I found a bottle of kombucha in the whole food shop that I buy malt extract from. On trying it, well... it was sweet and fizzy, which wasn't exactly what I was after, but it should be possible to tweak both. The underlying flavour was nice, so I pressed on to Step 2. 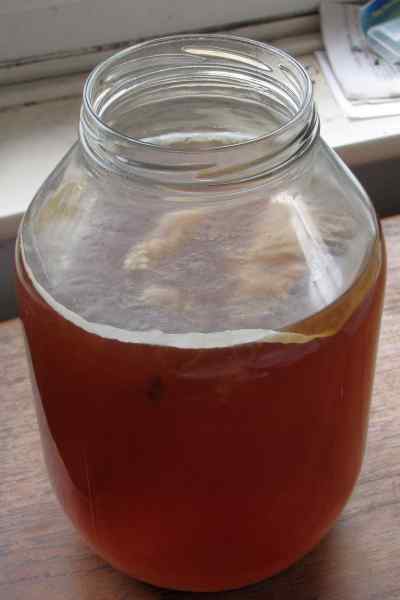 Step 2 was cultivating a mother of kombucha, or SCOBY (symbiotic culture of bacteria and yeast). I checked before buying that the drink wasn't pasteurized, which would kill the yeast and bacteria. 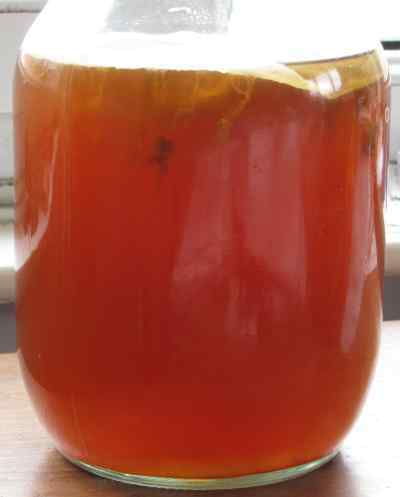 I saved a little of the drink to breed a new SCOBY from, and put it in a pint of sweet tea (normal black tea - one teabag in one pint* of boiling water, leave to cool then remove teabag and add two tablespoons of sugar). I covered the jar with cloth, put it in a warm-ish place and waited. A light, white film formed within a few days, but then nothing seemed to happen for ages. It was about a month before I had something resembling a kombucha mother. I'm sorry I didn't take a photo at this stage, but then again, perhaps best not - they're not pretty. Now I had a mother and starter tea (a lot of the yeast cells are in the liquid, apparently, so you need both) I moved on to a larger batch: three and half pints or two litres of water, which is about the capacity of my larger saucepans, three teabags and 100g sugar. This time I used two green teabags with one black one - I have some rather old green tea with mint that needs using up, so I ignored the advice about not using flavoured teas at this stage (apparently the oils can inhibit the bacteria) and chucked a couple in. This went into a half-gallon jar that once held pickled eggs, scavenged from the local pub. It took a while to get rid of the pickled egg smell, but it's OK now. This being rather heavy, I decided against the top of the cooker as the warm place. 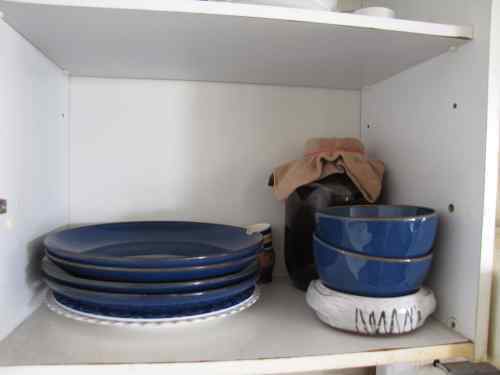 The adjacent cupboard gets quite warm, too, as it's against the chimney. I say quite warm - I put a thermometer in there and it read 18°C. It's all relative. Two jugs were evicted and egg cups were rearranged to make room for this. In theory, having the jar tucked away at the back of the cupboard should stop me moving it all the time to have a look and see how it's doing, but it didn't quite work like that. In spite of my interference, a new scoby formed within a week, albeit a thin one. I tasted the drink at seven days and liked it, though it's still a bit on the sweet side, if nowhere near as sweet as the commercial one. The misty film on the top develops into a cellulose mat. The old one floated up underneath the new one, which is what the beige patches are. The edge is bent down where I poked a dropper through to sample a bit before deciding whether to bottle it. From the side, you can see bits hanging down from the floating mat. It's supposed to look like this. Apparently this is a good thing. At this stage, people often add flavourings and a little extra sugar when bottling, for a second fermentation, to produce a little fizz. It's very much like making beer. Since the drink's already a bit sweet, I'm not adding any more sugar this time. Also, at this stage, I'm sticking with the natural flavour, though I'll probably experiment with flavourings at some point. The main change I'm planning to make is to replace the tea with something that doesn't have caffeine. Apparently it's the tannin that's important, so oak leaves are an obvious choice. I think beech leaves have tannin, too, and also blackberry leaves, which I may try if I don't get round to hacking back the brambles before they put out new leaves in the spring. I'm hoping that with a bit of playing around, I'll end up with something that's (virtually) non-alcoholic, has no caffeine, almost no sugar, but still tastes good. It sounds like a pretty tall order, when I put it like that, but I think it might be possible. It's got to be worth a try, anyway. * I knew that American gallons are smaller than British ones, but it only recently occurred to me to check pints - yes, American pints are smaller too. I'm using British pints.